1948 Monthly for LUNCH at J Bella 1:30 3rd Thursday of the month. Contact: Dave Kane at 216-941-7572. HAPPY 75TH Birthday to the classmates of 1962. Join us at the 2019 Golden Redmen Reunion Aug 24th at PSH. Birthday party +Cake! 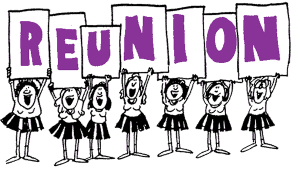 1971 50th Reunion info Contact Char Eastin Rossi charrossi@gmail.com or 216-226-4884 Planning now for September 2021. Save September!! PSH Class of 1974, 45th Class Reunion. Cost: $25 per person – thank you to Tony Maloney’s for helping us make this an affordable event! A postcard with all details and payment address will be mailed – PLEASE SEND YOUR RESERVATION AND PAYMENT AS EARLY AS POSSIBLE. We will need an accurate head-count so your reservation with payment is needed – thank you! We’ll use the list we updated for our 40th reunion. If you have moved within the last five years, please email your updated address to: PSH1974reunion@gmail.com. If you have information on anyone from our class that you can share – updated address, life status, anything relevant that would help us locate class members, please contact us via email: PSH1974reunion@gmail.com. This email address will be monitored as often as possible. 40th reunion, November 23rd, Saturday. Weymouth Country Club, Medina, Ohio. Please contact Catherine Smith Kornaker on Facebook or razelberry@frontier.com with Change of address. Sending mailer in August with details. 8:45 a.m. – 11:00 TOUR BEGINS 9 AM SHARP! IF YOU MISSED IT FOR THE 30TH, NOW IS YOUR CHANCE! Meet in the Cafeteria, off Longwood Drive. Parking near the back Bus Loop and Cafeteria where we used to park. The building tour is approximately 2 hours and very informative. Wear comfortable shoes. Please R.S.V.P. to dawnyreed@aol.com, NO later than July 22, 2019. Cash bar, free bad to the bone appetizers! Music by DJ Freeze! Cowabunga games like a 50/50 raffle, outdoor boss patio, kickin’ music, total memories with your dudes/dudettes and more! Please R.S.V.P. to dawnyreed@aol.com NO later than July 22, 2019, or confirm your reservation through our Facebook Event Page at: Parma Senior High – Class of 1984.